The total length is 25.5 with front anchor and swim platform. Sleeps 4 with center table installed. This boat comes with a lot of custom work including solar,radar arc and fiberglass swim platform. It has the typical stereo, sink and fridge and also comes with an HD TV and HD antenna, there is an inverter that utilizes its own on-board batteries connected to the solar panels. The toilet was installed 2012 and NEVER has been used. Comes with a tandem axel Trail Master custom trailer with surge brakes. Pulls nice but the carpeted bed rails need recovered as seen in the pictures. The boat canvas was replaced about 6 years ago and still looks good, it has 2 sets of canvas, one is typical for storage and in fair condition and the otheris the full enclosure with windows and in excelent shape. There is a matching Bimini top installed as well. All electronics included with a Garmain GPS for big water, eagle 2 fish-depth finder, and a VHF Radio. There is also a Magellan GPS to help find bars and restraunts when on the river. This boat also includes an engine mounted dual Minn Kota trolling motors that also utilizes its own batteries. All Hydraulics work fine. The batteries were in storages with tenders on them but are getting older. You only need one to run the boat but comes with 2 in the motor department, 2 more in the rear storage to run the trolling motors and 2 smaller solar batteries to run the cabin inverter. The gel coat is in good shape but the boat needs waxed and polished out to get that shine it had back in 2012. The pictures were taken about 2 weeks ago and you can see it is due. The exterior seats are good shape for being 25 years old. The cabin interior could use some love because the material covering the seats\couch is dated and needs updated. It will depend on the new owner if the desire to do this. 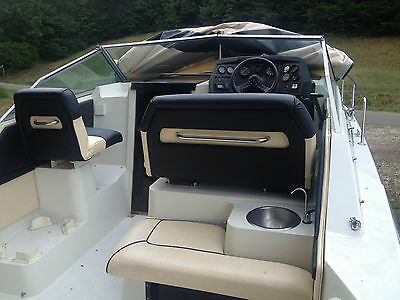 The boat does not look like your typical bayliner and you will be hard pressed to find another 2255 that looks like it. The custom radar arc suports the solar panels and has built in blue lights for the evening cruise. It's a big boat but not so big that full size vehicle can't pull it, it is also easy to load and unload on boat ramps. We have lots of money vested in this boat but our lake has been closed by ODNR for the next 2 to 4 years for Dam repairs. The boat has not been on the water since 2012 but was winterized by a profesional and pulled out and restored every year. I just pulled the boat out of storage 5 weeks ago and put the water muffs on it, the 3.0 alpha one merc purred beautifully. The boat cruises nicely18-22 MPH and gets great gas milage. It is an eye catcher and ready for water. 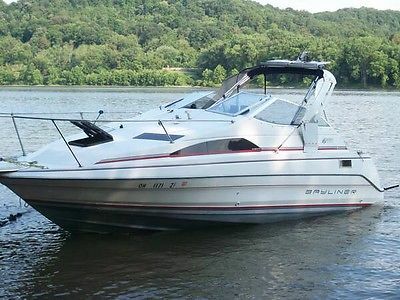 This 1990 Bayliner is in good condition for it age but far from perfect. Please ask all questions before bidding. I will take pictures of anything you ask to see. The boat has been in fresh water only its whole life. With that being said the boat is being sold as is. I have 100% feedback and plan on keeping it that way….happy bidding! 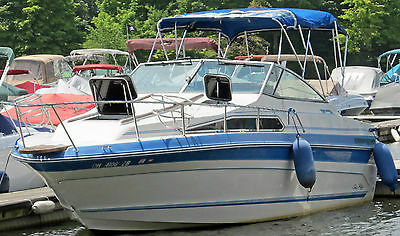 Searay 268 Sundancer 1988 Cabin Cruiser w/Aft Cabin & More - Beautiful Boat! 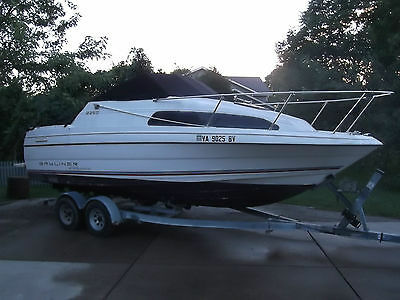 Searay 268 Sundancer 1988 Cabin Cruiser w/Aft Cabin & More Features Two Tone Gel Coat – Blue Engine – 7.4L Stern Drive (330hp) Runs and Sounds Great! Out Drive - Mercruiser Alpha One Shore Power Package Dockside Power w/Cord Alcohol/Electric Stove Dual Voltage Refrigerator Dual Volt Light in Galley Hot Water System w/Exchanger Converter Foldaway Aft Seat Camper Canvas Package Side Curtains Camper Boot Camper Aft Cover Cabin Deck Window Blinds & Drape Trim Deck Ventilation Hatches (2) w/ Covers Convenience Package Speedometer Compass Hour meter Windshield wipers Fresh Water Wash Down w/Cockpit Shower Dockside Water Inlet Ski Tow Uniden VHF Radio w/8’ Antenna Lowrance 522c Sonar Fish Finder and GPS w/upgraded Software Dimension Specifications Centerline Length (w/platform) 28' 3" Centerline Length (w/o platform) 26' 8" Beam 8' 6" Dry Weight 5475 lbs Draft (Down/Up) 34" / 16" Water Capacity ***** 24 gallons Fuel Capacity 100 gallons Height (waterline to top of windshield) 7' 3" Keel to Top of Windshield 8' 7" Cabin Headroom 6' Included Accessories Cruisair 5000 Carry-on Air Conditioner 4 Large Taylormade Fenders w/covers Custom Dual AxleTrailer Magma Newport Stainless Steel Grill Original Owner's Manual & Paperwork Diehard Platinum AGM Size 37 Batteries (2) New 2014 Extra Original Teak Bimini Cover 19" LCD TV/DVD AC/DC Camper Cover w/Carry Bag Misc Handtools Bottom Paint (May 2014) 2 Rolls Original Pin Striping Extra Prop Lowrance GPS Fish Finder Fat Head "SLASH II" Double Rider Towable 2 Anchors (One new anchor line) Life Jackets - 6 Misc Dock & Mooring Lines Extra Dinette Table Item Condition: This item is used and in beautiful condition. It runs great, sounds great and looks great. Lots of storage, and just an awesome boat. Questions? Please email any questions BEFORE you bid and BEFORE the end of the auction. If you have an issues, problems or concerns after the auction, please contact me before leaving feedback or contacting eBay. I promise I will make it right. Shipping Charges: Local pick up only. Currently Docked at Alum Creek State Park Marina. Payment accepted: Cashier's Check or Cash. We appreciate your business: Thank you for visiting this, and all of our auctions.